I wanted to know why cold press juice was so good and I discovered that the slower the juicer, the better the juice. So, what is a slow juicer? It differs from a normal juicer in that it extracts the juice at a low speed in order to keep the temperature as low as possible. The faster the juicer runs, the hotter the juice gets. During the heating process, vitamins, minerals and enzymes that naturally occur in fruit and vegetables are diminished. Aha! That’s what this is all about. Slow juicing or cold pressed juicing maintains the highest nutritional value of the juice. This also delays the oxidisation process, so you can keep it in the fridge longer. Click here to see the best cold pressed juicer on our list now. I have since discovered that not only are cold pressed juices good for you, but they taste good too. In fact, so good that even my kids and husband are drinking them too! I’m here to help you find the best buy cold press juicer Australia has to offer! 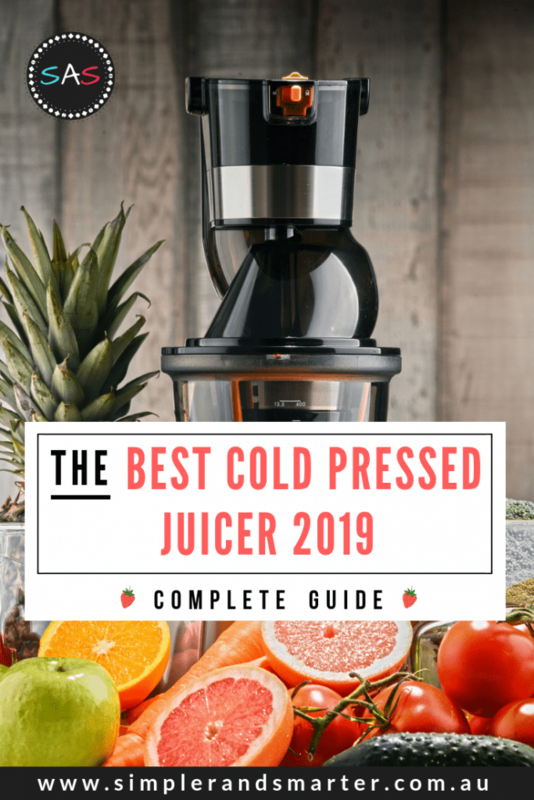 With our complete guide and comprehensive cold pressed juicer reviews below, you’re sure to find the perfect cold pressed juicer for you and your family. 3 How Is Cold Pressed Juice Made? Handy reference list – see all cold pressed juicer reviews below! What is cold pressed juice? 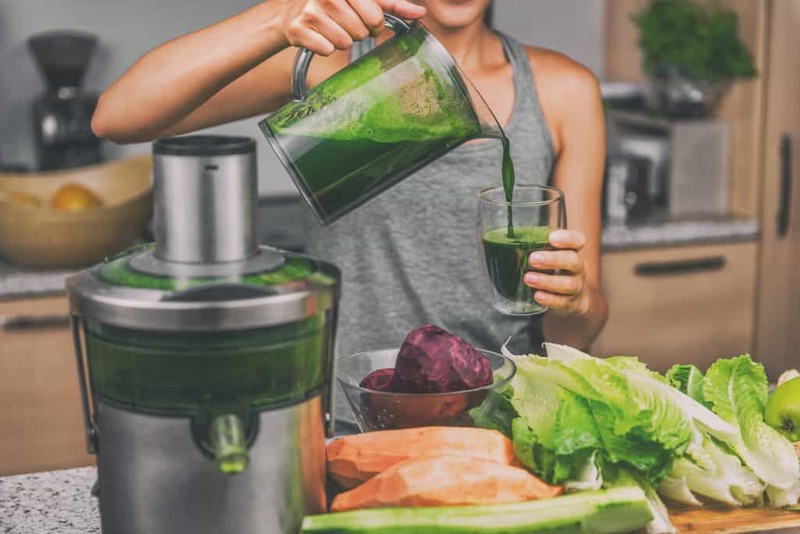 Well unlike other juicers, a cold pressed juicer (also often called a masticating juicer) preserves most of the nutritional quality of the fruits and vegetables as the juicer doesn’t use any heat in the juicing process. Traditional juicers use fast moving blades to separate the juice from the pulp. How to make cold press juice? Well a cold pressed juicer uses a hydraulic press that squeezes and crushes the juice from the fruit or vegetable. Therefore, cold pressed juicers are also often referred to as slow juicers. This slower process is the best way to extract the juice not only to get the greatest quantity of juice, but to do so without losing as many nutrients. So are cold press juicers the same as slow juicers? Slow juicer vs cold press juicer – they are the same thing and the terms are used interchangeably including throughout this post. Why are cold pressed juicers better than conventional juicers? Read below! Health benefits of cold pressed juice – You may be wondering what are the cold pressed juice benefits? Well as you know fruits and vegetables are a great source of vitamins, minerals and antioxidants. Drinking a cold pressed juice is one of the easiest and quickest way to get these nutrients into our bodies. Together with a balanced diet, drinking a cold pressed juice or going on a cold pressed juice cleanse is a great way to help detoxify our bodies, boost immunity and promote an overall healthy lifestyle. Keeps the fruits and vegetables nutrients intact, plus more juice – As mentioned above, using a cold pressed juicer allows you to keep as much nutrients from the fruit and vegetables as possible as well as extracting much more juice than conventional juicers do. When I first made cold pressed juice, I was super impressed with how much juice it extracted! Unlike ordinary juicers, a cold pressed juicer also preserves the natural crisp taste of the juice. User-friendly and safe to use – The best cold pressed juicer or the best slow press juicer is super easy, in fact much easier than your typical juicer. Instant, convenient juice – There are a stack of juice bars popping up all over Australia. However, the beauty of having the best slow juicer Australia has on the market at home is you can make your own cold pressed juice whenever you like! They are quick to make and will save you money and time in the long run. The three main juicing methods are single gear / single auger, twin gear / twin auger and centrifugal. Single auger and twin auger are both cold pressed juicing methods, due to the low speed and cold or no heat created during the juice extraction process. Of all of these, the twin auger is the superior option. Basically, the lower the speed of the juicer, combined with the additional technology of the twin auger allows the deep seated nutrients and enzymes to be released, while ensuring the majority of the heavy metals and pesticides are stored in the fibrous waste pulp. Cold pressing also reduces rapid oxidisation to juice, sometimes referred to as “Living Juice” as it maintains nutrients for up to 2 days when stored in the fridge. There are a variety of different features that both a domestic and commercial cold pressed juicer for sale may come with. Many of these features are designed to save you time. For example, some of the best cold press machine options will have a wide feeding chute so you don’t have to chop up your fruit and vegetables super small as well as having a large pulp collection system. This will save you the trouble of regularly emptying it out. You also want to buy a cold press juicer that is easy to clean, so check how many parts there are and ensure they are dishwasher safe. If you are a regular juicer, you might want a compact cold press juicer that can permanently sit on your kitchen bench, so the size of the juicer will be an important consideration. Consider the speed control of the juicer. Whilst you want a slow juicer for the maximum health benefits, you also don’t want it to take any longer than necessary. The best juicer will take around 5 minutes to produce one cup of juice at a speed of 80 RPM. 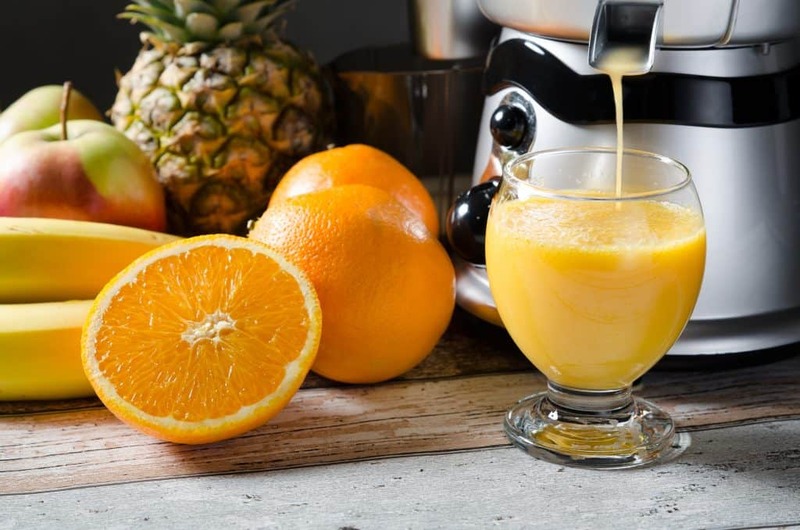 Like most modern-day appliances, many cold pressed juicers can perform a range of other functions such as making pasta, grinding coffee and a range of other blending type functions. Price is also an important feature. Do you want the best cold juicer on the market? Or will a good overall cheap cold press juicer do the trick? What is the best cold press juicer on the market? Whats the best horizontal cold press juicer? Discover the answer to these questions and more in our reviews below! Hurom make high quality slow juicers to help improve your health and well-being and this is one of two Hurom juicers that has made it to these top slow juicer reviews as it’s one to consider when asking what is best cold press juicer. This juicer uses a slow jumping method of juicing by squeezing the fruits and vegetables and beautifully juices a wide range of fruit and vegetables from leafy vegetables, watery fruits, soft fruits and more. So you can use any of the best vegetables to juice as well as fruits, depending upon your mood. This juicer has a powerful motor which operates without making too much noise. 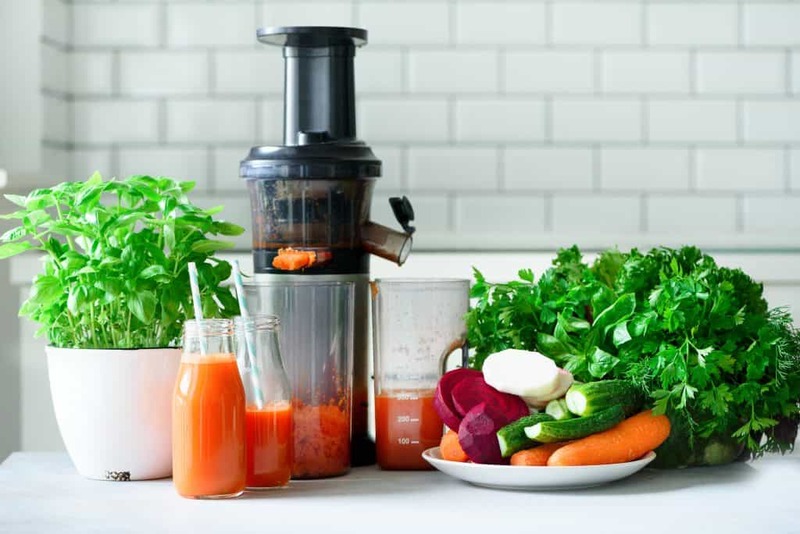 You can also adjust the pressure inside the drum with the lever, allowing optimum squeezing according to the fruit and vegetables you are juicing, making it the best cold press juicer for leafy greens. Other features of this juicer include both a normal and a smoothie strainer as well as juice caps so you can make juices both to the texture and taste of your liking. Also included are two cleaning brushes. The Hurom slow juicer is a top-quality juicer if you can afford the hefty price tag. This Breville slow juicer is a great option for the best cold press slow juicer as it contains multiple features and is a great price. How to cold press juice in this machine? Well the cold spin technology allows juice to flow up through the juicing system and makes up to 2 litres of juice at a time. The Seal and Store Juice jug of the Breville cold pressed juicer means you can store the juice directly in the refrigerator. Juice can be stored in the jug up to 3 days. This Breville Juice Fountain Cold juicer has two speeds (fast and slow) and operates reasonably quietly. It has a powerful motor which processes the toughest fruits and vegetables in seconds. It has an extra wide feed chute so no need to chop up your fruit and vegetables into tiny pieces as well as having an extra-large pulp container (3.4 litres) so you don’t have to constantly empty it out. This means delivery of delicious organic cold pressed juice quickly and easily. Other features include an overload protection LED, safety lock mechanism to prevent unsafe operation and a cleaning brush. However it is noted, that it is not a traditional style cold press juicer. This juicer is a hybrid of sorts, utilising the standard centrifugal or high-speed design to extract the juice, and keeping it under 2°C by sending the juice through a cool mesh system (cool spin technology) prior to directing it into the jug. The Breville cold press juicer XL is well priced and super-fast, and like the previous Breville juicer, it is said to maintain key vitamins and minerals by utilising the trademarked Cold Spin Technology. The extra-large feed chute allows for large pieces to be added, saving time on cutting up fruit and vegetables. The Breville Juice Fountain Cold juices up to five times faster than a traditional cold press machine, while keeping the temperature below 2°C to maintain the structure of the fruit and vegetables. A large pulp container reduces the need to empty during juicing sessions. The seal and store jug is 2L, enabling you to juice enough for a few days and store in the fridge. A 3-speed juicer, it gives you different options depending on what you are juicing and how quickly you want it! When operating on the quiet speed, noise is reduced by 40%. This is a well-priced juicer that is quick and easy to use. Like the other Breville juicer this is not a traditional style cold press juicer. This juicer is a hybrid of sorts, utilising the standard centrifugal or high speed design to extract the juice, and keeping it under 2°C by sending the juice through a cool mesh system (cool spin technology) prior to directing it into the jug. With a vertical design, this cold press juicer is compact, looks great on a kitchen bench and comes with a solid warranty, ten-year motor guarantee and 5 years for parts. Constructed from BPA free polycarbonate, your juice will be as good for you as it can be. This entry level juicer comes complete with fine and coarse juicing screens, so you can manage how much pulp enters your juice. Extracting 35% more juice than standard juicers, the BioChef Synergy Slow Juicer features a juice outlet cap ensuring your juice is mixed as it pours into the jug, ready to drink straight away. Not too heavy at 6.4kg’s, you have a choice of colours too, black, white, red or silver. 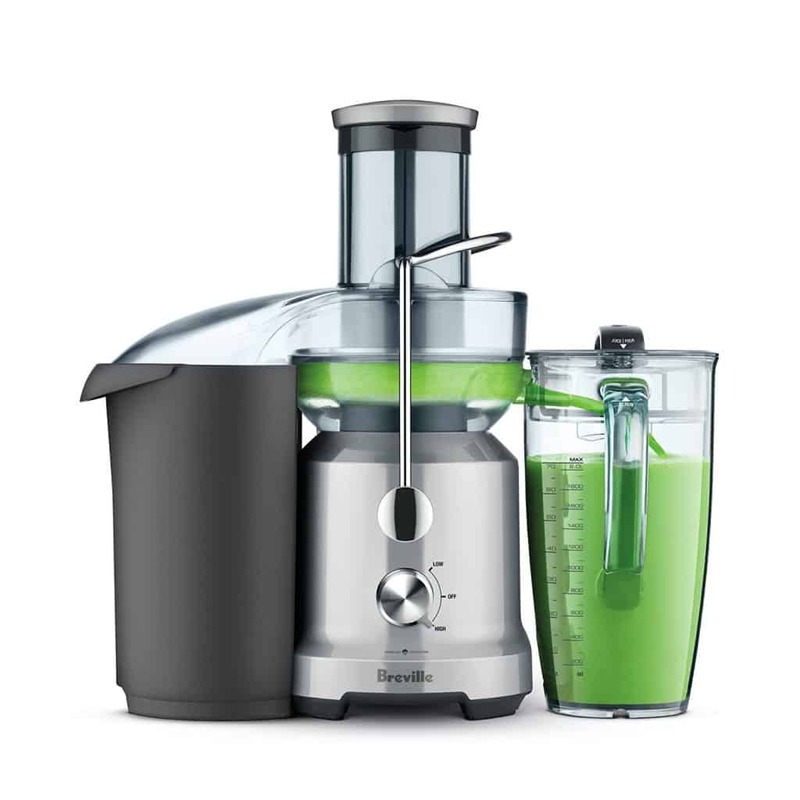 A good option, this entry level juicer will get you on the scene and is backed by a reasonable warranty. This masticating juicer is an excellent choice if you are juicing leafy greens or wheat grass, while still able to juice fruit and vegetables well. A quick release function assists in the cleaning process, as does the cleaning brush. The compact design means smaller jugs for catching juice and pulp. This also means if you have little space or need to move it around, it is a good option. 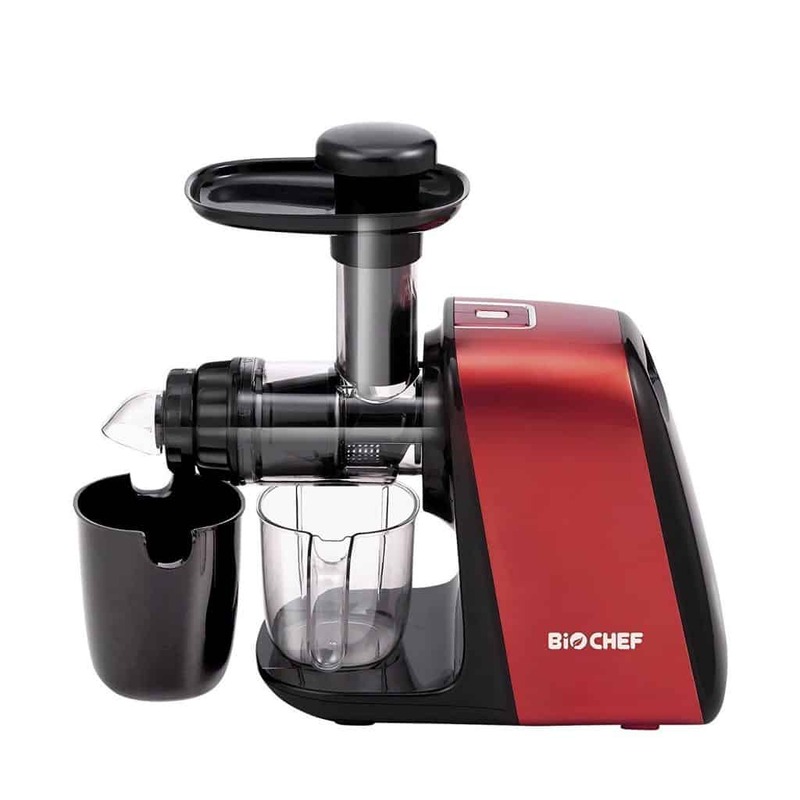 As with the BioChef Synergy, this juicer is made from BPA free polycarbonate. The pulp nozzle is adjustable. This considered design aspect allows you to change the pressure at which you are juicing, getting the most juice out and leaving the pulp as dry as possible. Lightweight at 4kg’s, this traditional cold press designed juicer comes in red or silver, a good option for small kitchens or if you need to travel. A big call from Kuvings, the silent juicer is about 50 decibels compared with around 90 for other juicers, making it much quieter but definitely not silent though. 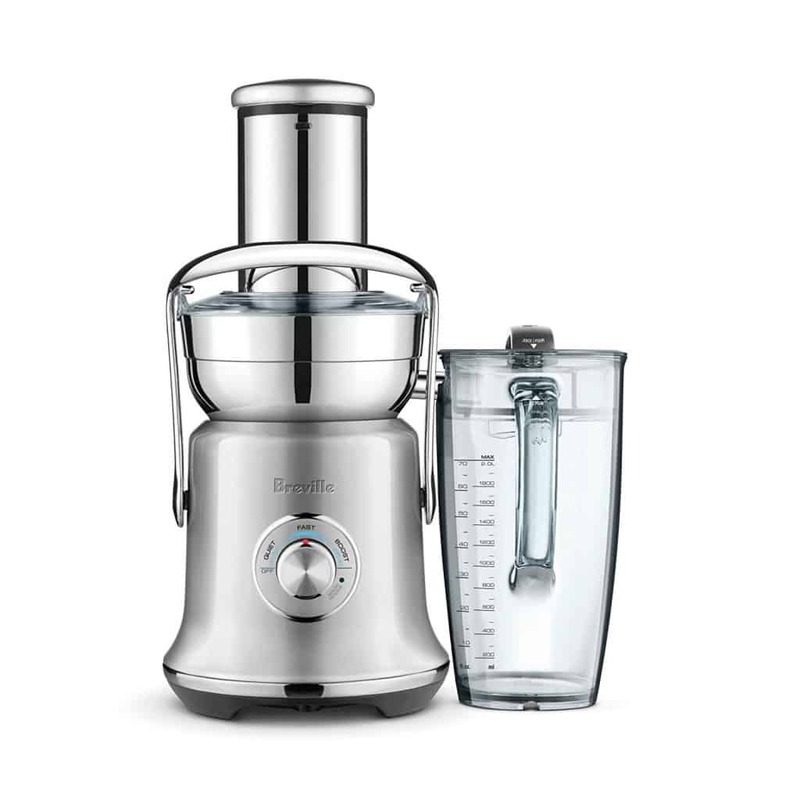 With a 10 year warranty, this juicer is at the top end of the price bracket. The Kuvings cold pressed juicer is an upright, masticating juicer. It’s compact, so you can leave it out on your kitchen bench. Naturally you are able to juice fruits and vegetables, however some reports include problems with juicing fibrous vegetables, such as ginger and celery. Some people have had trouble separating parts for cleaning, and have been unsatisfied with the customer service available when trying to source parts or discuss operation issues. BPA free juicing components, provide safe juicing surfaces, the Kuvings Silent Juicer also juices soy beans to make soy bean milk in minutes, or your own tofu. For the price you would want this to just about make you dinner, not just juice and tofu, with some dissatisfied reports from customers, it is worth triple checking if you are interested in purchasing. The Omega cold press juicer is a vertical juicer. It’s on the heavier side at 10.6 kg’s and has a medium footprint. This is something to consider if you are wanting to leave it on your kitchen bench. The most expensive juicer reviewed here, the Omega VERT Slow Juicer comes with a 15 year warranty. This single auger juicer operates at a very low speed, 43 rpm, the juice extracted will maintain more of its naturally beneficial properties and it will be noticeably quieter. It is able to juice leafy greens and wheatgrass as well as fruits and vegetables. The Omega VERT Slow Juicer boasts the ability to make nut milks, however some reports have indicated that it is more efficient using a nut bag. The included juice tap means more control of juice flow during juicing. This Optimum cold press juicer has a modern design, and looks to be modelled on an Italian espresso machine, looking right at home in the kitchen. Available in silver, red or black, the Optimum 600 Big-Mouth cuts down on preparation time due to the wider chute. A lifetime, yes, lifetime motor warranty and 5 year parts warranty is impressive. Low speed and noise due to the operating speed of 43 rpm, this juicer also comes with a juice tap. Cleaning is assisted by the self cleaning function and included cleaning brush. 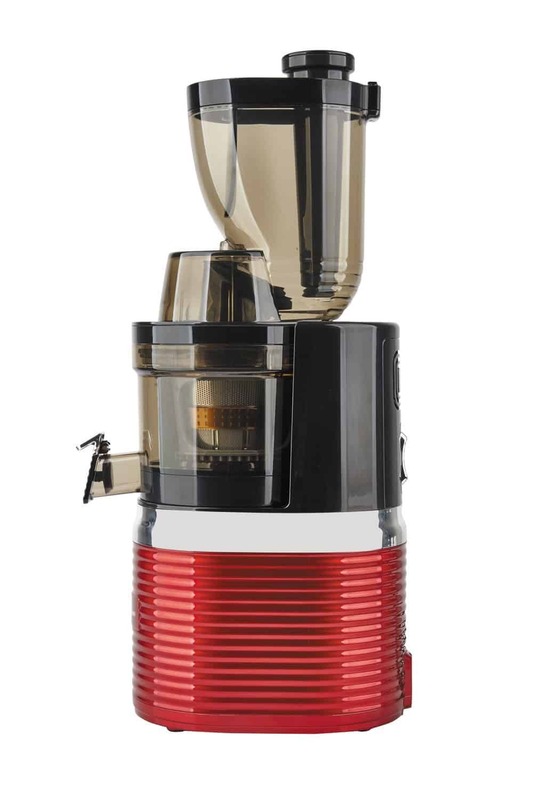 With classic Italian and art deco design aspects, the Optimum 600 Big-Mouth is moderately priced and comes with good reviews and an impressive warranty. The HUROM Slow Juicer is a compact vertical slow juicer. This Japanese designed juicer has a simple 70’s feel, available in ferrari red. 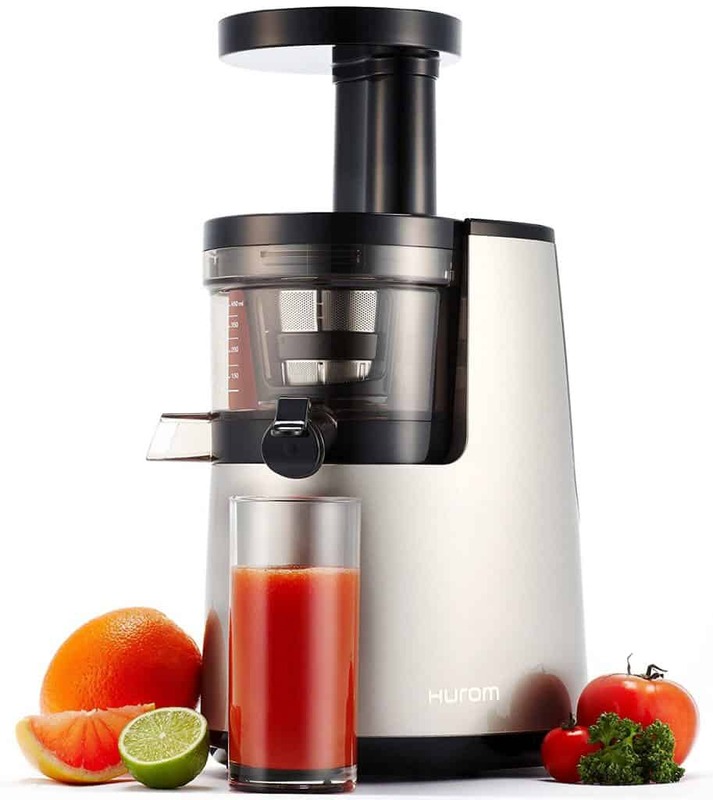 Low speed and quiet, the HUROM Slow Juicer operates at around 43 rpm. A 50mm chute is a reasonable size, meaning minimal preparation. Able to operate for 30 minutes continuously, you will have plenty of time to make your daily juice. Complete with a fine or coarse strainer, Hurom has gone one step further and added a pulp control lever. This allows you to make your juice, just the way you like it. Made from BPA free plastic, with a focus on usability and durability, the strainer and auger are 8 times stronger than traditional plastics. Able to juice leafy, fibrous fruits, vegetables and nuts, this allrounder can not only produce nut milk and tofu, but ice cream too! It’s also much cheaper than something like the Greenstar Elite. The Oscar Neo XL Whole Fruit Juicer is a commercial grade, stainless steel juicer, incorporating BPA free juicing parts. Low speed and low noise, the Oscar Neo XL comes with a 3 year commercial grade warranty, making this ideal for cafés or juice bars. If used in a domestic situation, you will have a lifetime warranty on the motor and a 5 year warranty on parts. This industrial cold press juicer has an extra-large chute for whole fruits and vegetables means almost nil preparation time, and the simple design means the juicer is easy to dismantle for cleaning. The self-feeding system reduces a build-up of pulp in the drum, resulting in a rinse under water for most of the parts. This juicer comes with 2 juicing screens and 2 collection jugs. A solid well priced functional juicer, this is a good entry level, well-made cold press juicer. 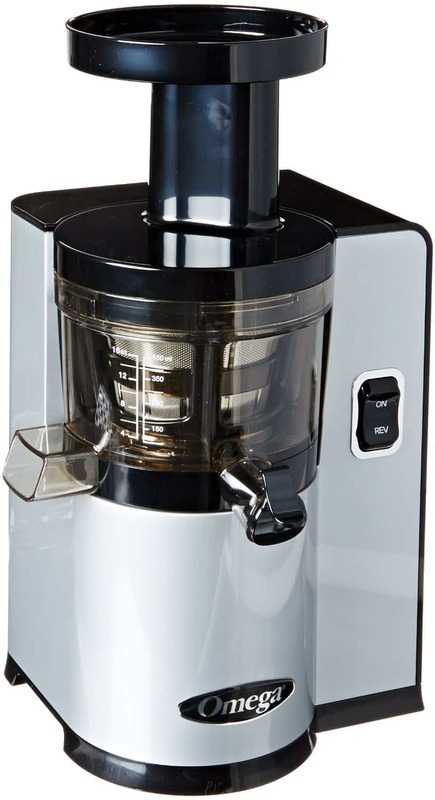 Another best cold pressed juicer Australia offers is the 5-Star Chef Cold Press Slow Juicer. This model works just as well as other best cold pressed juicers, with a 83mm wide chute which extracts maximum juice from fruit and vegetables. Like many other slow cold press juicers, it also has the ability to make sorbet. What’s more, it’s easy to clean making it among the better cold pressed juicers Australia offers. Another one of the best cold pressed juicers is the Todo Slow Juicer, and for several reasons. First, the quantity of juice is quite substantial compared to other home cold pressed juicer options we’ve seen. Although it’s not in the same field as an industrial cold pressed juicer, it does have 2 speed settings and a reverse and forward switch offering some flexibility. Plus it’s affordable, so it’s one budget conscious people should consider when asking what is the best cold press juicer to buy in Australia. An improvement on the previous Hurom model, this model features elements from the best commercial cold press juicer. The remodelled version is said to be twice as slow yet even more efficient at producing natural, enzyme rich juice. Considering that the best cold press juicer to buy for many of us is one that produces the richest quality juice at the lowest price, this is a product to consider when working out which is the best cold press juicer to buy. This is particularly so if you’re asking what’s the best cold pressed juicer for greens – it retains maximum nutrients. Read my full guide to the best juicers here. 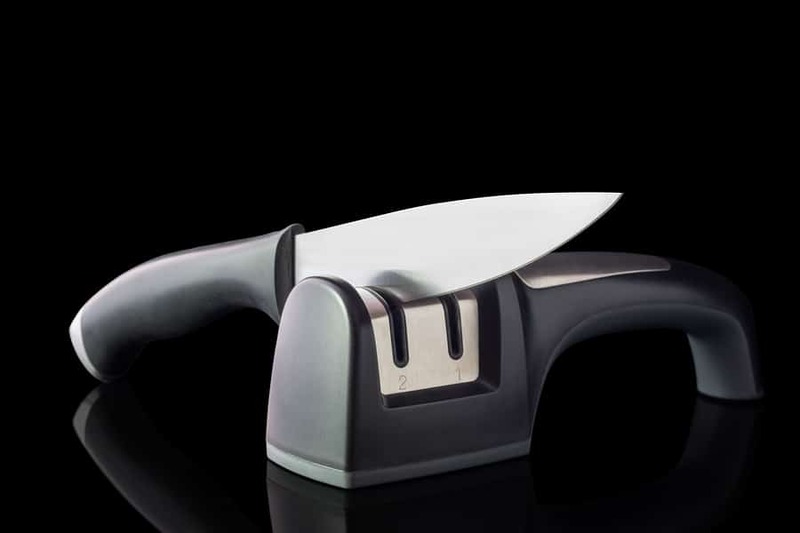 Looking for other cooking appliances? Check out our other buying guides here. 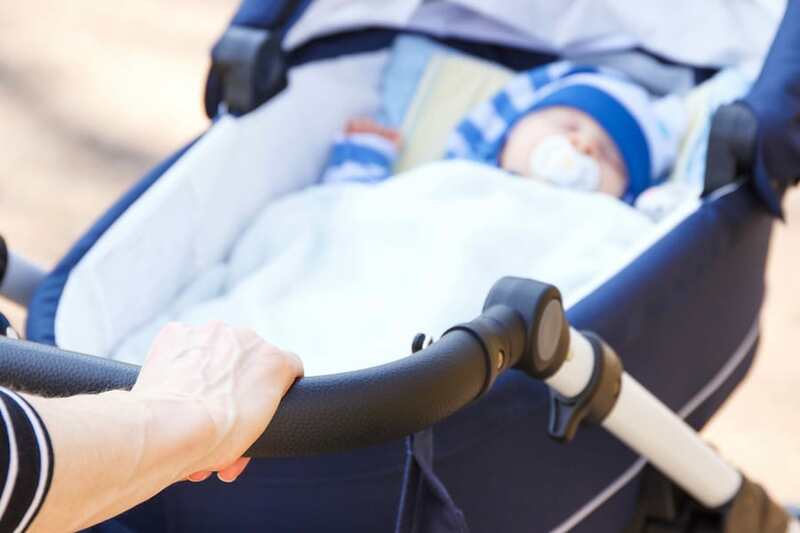 Ultimate Buying Guide To Choosing The Best Pram 2019 in Australia!